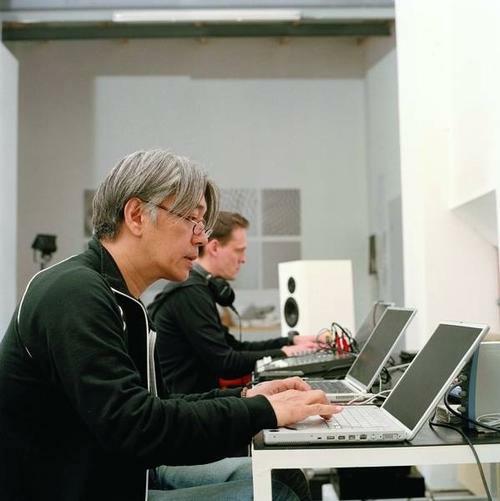 In one of the more austere corners of contemporary experimental electronic music resides a series of luminous collaborations between the musicians Carsten Nicolai (aka Alva Noto) and Ryuichi Sakamoto. Over a series of five recordings, Vrioon (2002), Insen (2005), Revep (2006), utp_ (2008), and summvs (2011) the duo have explored mixing electronic and acoustic sounds into a meditative whole that is at once icy and expressive, breathing and precision-engineered. Both musicians are polymath artists. Nicolai, who is German, makes electronic music under his Alva Noto alias out of the barest of materials, looping tiny shards of sine tones, static, and fuzz to make a rhythmic music that is minimal in sound but alive with constant micro-changes. 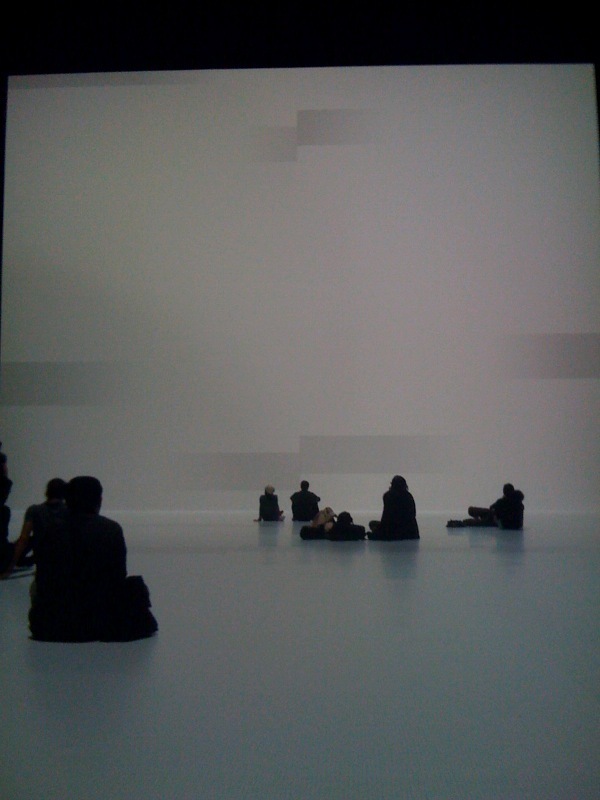 Nicolai/Noto also runs the Raster- Noton label and creates sound art pieces that have appeared in art galleries worldwide. Sakamoto, a pianist and composer, is music royalty in Japan. He founded the electropop band Yellow Magic Orchestra back in the late 1970s, has written soundtrack music, scores for the opening ceremonies at the 1992 Olympic Games, designed ringtones, and collaborated with numerous other artists on projects ranging from operas to pop songs. The Noto-Sakamoto collaborations were composed by the artists trading audio files back and forth. While I have no idea how exactly the music was created, it sounds as if Sakamoto’s modal chord-based piano playing (improvisations?) were subjected to Noto’s digital treatments–looping the piano, stretching and repeating phrases, dissecting it into micro-slices–with some Noto static-fuzz percussion added in to make to make it all gel. Sometimes the music sounds like a piano infected with digital viruses, scattering its notes into strangely ordered patterns guided only by the most minimal of frozen rhythms. What I like about the music is that it merges Noto’s and Sakamoto’s distinct voices into something unique. But let’s go deeper. 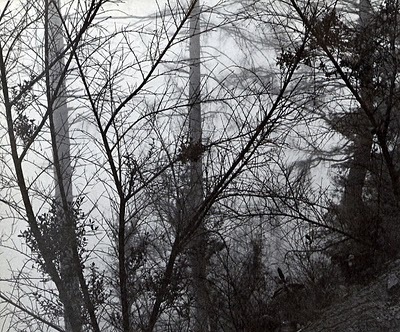 In electronic music making, one always runs the risk of succumbing to what could be called sound fetishism–that is, ascribing supernatural powers to particular sound timbres. The electronic musical instrument industry certainly encourages this with their non-stop release of “new” sound presets that promise to take your music to the “next level.” Everyone wants either the newest sound or, for the adventurous, to create their own never before heard sounds. In this way, everyone wants to be a pioneer sound explorer, discovering treasures out of which to make new music. And yet, here we have Noto and Sakamato using a deliberately limited sonic palette–basically just piano and digital sine tones and percussive static–which does two things. First, it brings you, the listener, back onto familiar ground. There aren’t really any “strange” sounds on these recordings, and so the music, while unique, is never exotic for exotic’s sake. Second, using a limited sonic palette allows Noto and Sakamoto to focus on really interesting structures and relationships between the sounds. It’s amazing, actually, how much can be done with so few materials. In his classic autobiography The Seven Storey Mountain (1948), Trappist Monk Thomas Merton (1915-1967) makes fleeting but repeated references to silence, sound and music. Here are two of them. “I liked the silence. It was peaceful. In it, my shyness began to die down, and I ceased to look about and criticize the people, and entered, somewhat superficially, into my own soul, and some nebulous good resolutions began to take shape there” (127). “It is an austere warmth, the warmth of Gregorian chant. It is deep beyond ordinary emotion, and that is one reason why you never get tired of it. It never wears you out by making a lot of cheap demands on your sensibilities. Instead of drawing you out into the open field of feelings…it draws you within…” (417). In his concept of biophilia, biologist E.O. Wilson (who is one of the world’s foremost specialists on ants, by the way) refers to our innate human affinity for the natural world. But if you read the passage above once more and substitute the words “information world” for “natural world” it makes sense in a different way: you’re reminded of our experience of living in an information-saturated world too. 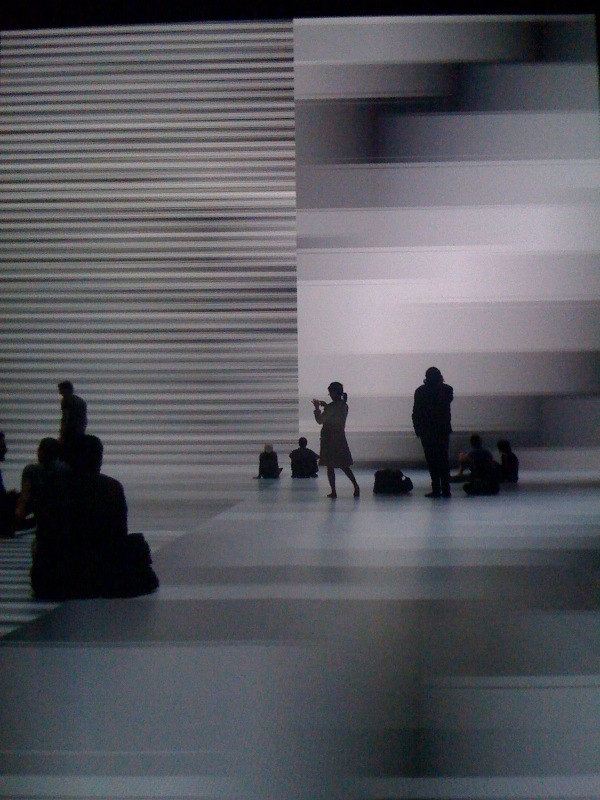 In fact, read this way, the passage gives a pretty good sense of how I felt while immersed in Ryoji Ikeda’s compelling audio-video installation piece transfinite (a composite of three previous pieces, test pattern, data.tron, and data.scan), now on display at the Park Avenue Armory through June 11, 2011 (Admission is $12.00). For the transfinite installation, there are a dozen speakers and four bass cabinets providing a powerfully immersive, multi-channel surround sound that changes depending on where you stand. The Park Avenue Armory is a vast space, so this on its own is a sonic feat. Listen here for an excerpt from a field recording I made while visiting the installation. The transfinite is actually quite finite– about the dimensions of a basketball court, with a fifty foot high vertical screen down the middle that divides the space into two equally sized 70-foot halves. 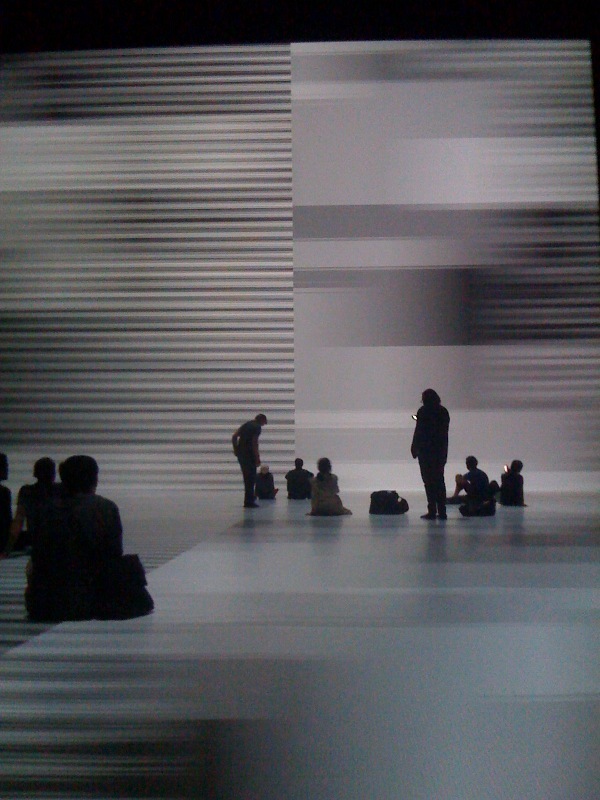 On the front half, both the floor and the vertical screen are lit from inside their smooth, vinyl-like surfaces, displaying an ever-changing, flickering and stuttering sequence of black and white visuals synced to the music (or is the music derived from the code driving the images? ): geometric shapes, parallel lines, graduated shades of grey, and pointilistic graph grids blinking and flashing a mile a minute. Interestingly, the space feels different as people come and go and change their sitting and standing locations on the glowing floor. In this way, listeners/viewers become a part of the artwork. 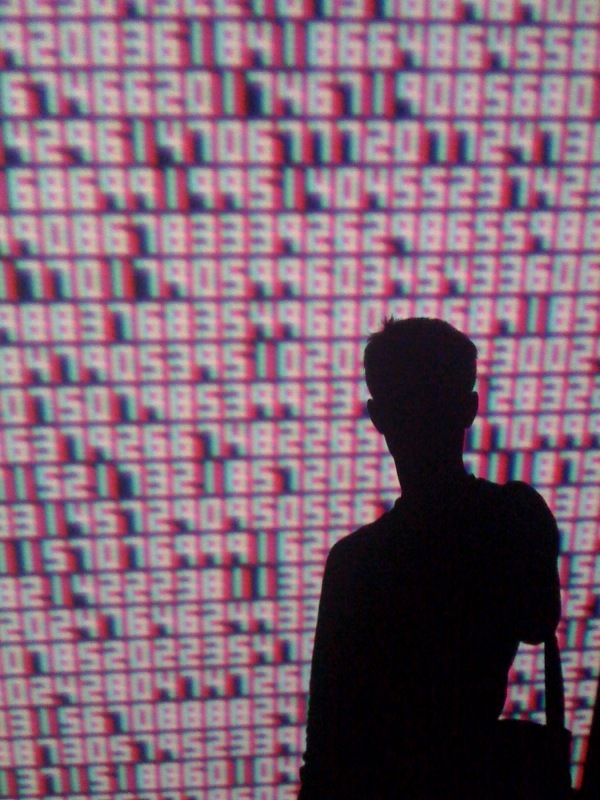 The other side of the vertical screen shows projections of streams of numbers–as if to depict the DNA code for the visuals on the front side of the screen. Up the middle of the floor space there are nine equally spaced, upward facing, waist-high computer screens showing various high-resolution 3D visual representations of data such as nucleic-like structures floating over grids, more streams of numbers, and other rotating geometric designs. 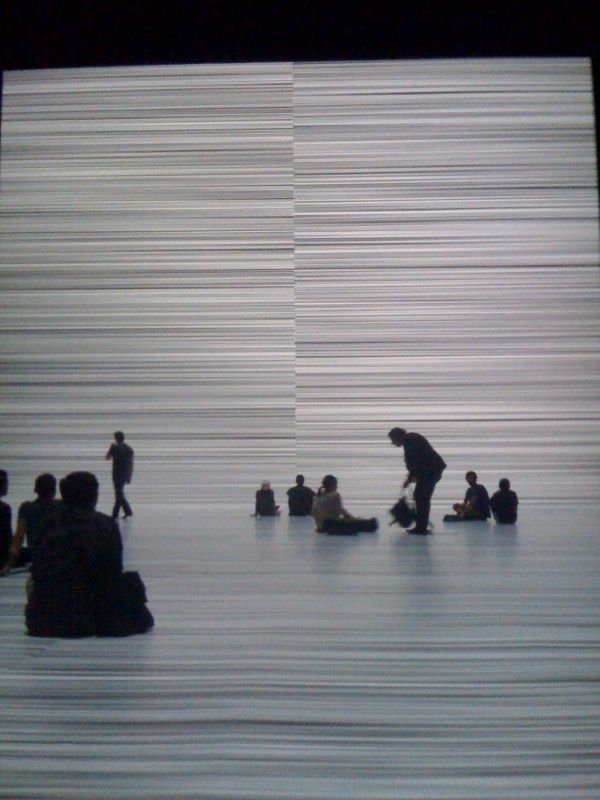 (Nothing ever stops moving in this installation.) It’s all very Minority Report-looking, and of course I tried to swipe one of the computer screens with my index finger to test for interactivity, but alas, I could only view and admire and try to decipher the digital images. And last but not least, the floor space on this side of the installation is covered in a soft, felt-like material that is striking because–back to E.O. Wilson’s biophilia idea–it grounds you. With your shoes off (visitors’ shoes must be removed), you feel the softness like beach sand, and this experience–this ancient experience of a textured ground beneath your (almost) bare feet–makes it feel as if your body is standing in nature while your mind has been hijacked by the datasphere. There’s a body-mind tension here that is really provocative if you’re open to it. 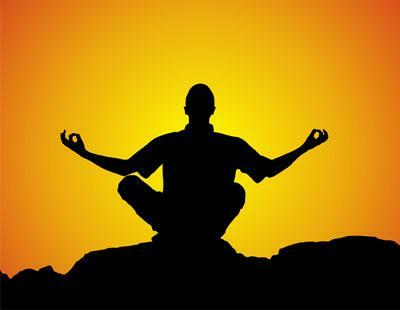 So what does the transfinite mean? In his artist statement, Ikeda notes that the transfinite is “the infinite that is qualitative and ordered” and that the subject of his piece is “the invisible multi substance of data.” While I don’t know exactly how Ikeda and his computer graphics programmers assembled their materials (there are apparently numerous computers working to power this piece), on the level of data the transfinite seems to be about the beauty of mathematics, about how strings of numbers can be re-purposed as artistic work. In this regard, Ikeda has created something powerful and affecting through what would seem to be rather impersonal and austerely rigid means. When taking in this work, prepare to feel quite small in the face of not only those large illuminated screens that will tower over you but also in relation to the sheer volume of data represented visually and sonically. If you want, you can approach and get up close to either side of the vertical screen, at which point a curious thing happens: a silhouette of yourself comes into razor-sharp, HD focus. Here you are (that’s me in the picture taking a picture of me), the listener/viewer projected right into Ikeda’s datasphere, a mind in the machine watching those data streams rain over you–a storm of abstract information coming too fast to ever make sense of. If there’s a better image for representing the immersive experience of living in the hyper connected, Facebook-ed, text messaging, Twitterific time of ours, I can’t think of one. I might be generalizing, but when I’ve overheard musicians talking about a musician they really admire and respect, they don’t usually say “He’s an amazing musician” or “She’s really a wonderful musician.” For some reason, what I hear over and over again are the words “heavy” and “deep”–as in: “She’s such a heavy musician” or “His playing is so deep, man.” Why do musicians return over and over again to heavy and deep when there are a million other ways through which to frame their artistic admiration? It’s possible, of course, that some musicians just don’t excel at, have much interest in, or the time for descriptive wordplay. But I think something else may be going on in the use of heavy and deep as their metaphors of choice. 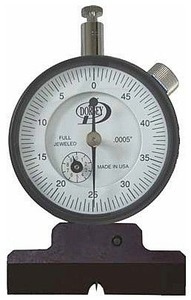 Heavy comes from the old English word hebban which means “to heave”; it means of great weight and has connotations of something difficult to lift or move. Deep means to extend far below a surface, or extending far in time or space, and has connotations of referring to something with a mysterious nature, something difficult to penetrate. A musician who is described as heavy or deep, then, is perhaps someone who makes music with gravitas, every sound they make seemingly solid, just right, perfectly timed and tuned, enduring. Or maybe their music evinces a vast well of body and cultural knowledge, references and associations. Maybe a great musician is both like a rock and like water–solid mass and flowing liquid. Are the words heavy and deep reserved for mature, older musicians? Can a child be a heavy or deep musician? Or like teenage chess masters, can they only be prodigies? Instinctively I want to say, no, child musicians can’t be heavy or deep, but maybe that isn’t so. I’m thinking back to YouTube clips I’ve seen of very young child drummers playing very intense and rhythmically sophisticated drum solos. Such effortless movement and graceful, ergonomic gestures around the drum set! So much body-mind know how at such a young age! (How can they know this and come by that knowing?) True, they’re not playing with anyone else, and maybe solos aren’t the ideal place for evaluating heaviness and deepness. Still . . . So: heavy and deep: powerful, evocative metaphors for speaking about musicianship. Marcus Boon’s recent book, In Praise Of Copying (Harvard University Press, 2010), is a timely argument in favor of our freedom to freely copy one another in the name of healthy creativity. Boon, a professor of literature at York University (as well as a DJ and contributor to Wire magazine) notes that the word copy derives from the Latin “copia” which means “abundance, plenty, multitude” (41). Copying is everywhere, and Boon eloquently argues that not only is copying an integral part of being human, but that “we could not be human without copying, and that we can and should celebrate this aspect of ourselves, in full awareness of our situation” (7). Part of what makes this book so authoritative on our situation is its own sheer copiousness and wide-ranging mobilization of ideas from philosophy, religion, critical cultural studies, anthropology, and music. Anchoring the book’s argument are some ideas from Buddhist philosophy, through which Boon makes deep and abstract observations about copying, beginning with the fact that nothing is ever truly original and that everything comes from something, thus everything in the world is a copy. We ourselves are copies too: namely, DNA copies (thankfully mutated ones!) of our parents (and their parents…). For the world as we know it, it’s copies all the way down. One of Boon’s main case studies is that of the Luis Vuitton handbag–the original LV which costs thousands of dollars and the many knock-off LV copies which look and feel practically identical but cost much less. One interesting point here is how originals need copies in order to assert their originality; there’s a subtle dialogue between the two that Boon argues is essential to the original’s thriving. So in the case of the LV bags, the knock offs are actually what give the original its imagined and real (i.e. dollars and cents) value. The idea Boon is getting across is that the essence of things is never fixed, for if it were, “it could not be transported to the copy, and imitation, even as a degradation of the original, would not be possible” (27). Musical practice is another useful locus for examining copying. The reason for this is due to both its evanescence and its resistance to being controlled and regulated as a thing. Music, notes Boon in one particularly luminescent passage, “appears and disappears fleetingly […] constellates into infinite sonic chains, precipitates collective joy, is eminently portable, and resists being turned into a thing or property–which is why folk cultures have such love for it” (65). Boon cites folk music and hip hop as traditions that each thrive on copy-based practices. Folk music cultures “are always cultures to whom nothing belongs, from whom everything is taken” (72), using and transforming whatever is at hand as the basis for a shared repertoire. (Think of all those simple chord progressions upon which countless songs are spun!) Hip hop too is a music culture built on copying, a response “to the industrial world” (69) through the reappropriation of technologies of sound playback (think about the turntable) for copying purposes. In both traditions, copying is at play “in the repetition of generic motifs and devices such as particular songs, rhythms, patterns, and practices…” (194). Overall, In Praise Of Copying offers an abundance of material to process and think through. Boon’s book also helps the reader make sense of our recent digital music revolution. Remember back in the early 2000s when Napster was so popular, when peer-to-peer file sharing of MP3 files seemed to be the future of music, and then how the recording industry shut it all down? (Napster is now a for pay subscription service.). Napster was loathed because it eroded the idea of a music recording as a charged object of desire with value due to its manufactured scarcity. Napster was also loathed because it effectively made any music that was in MP3 format a fluid, copyable thing again. And Napster was inherently pro-copia and consumers loved it–free music!–while the recording industry hated it. In Napster’s wake, of course, came Apple’s iTunes, digital rights management (which prevents you from making endless copies of all those songs you bought for 99 cents apiece), and a return to what Karl Marx would call “commodity fetishism” (183). And here we come to the crux of the matter: music was never meant to be an object, but rather a shared, impermanent experience. But with industrialization, capitalism, recordings (copied sound objects), and copyright law came the notion of music as property and the possibility of manufactured scarcity (and our fetishizing of commodities). Copia, our abundance and shared heritage of creative work, has been, in our era, hijacked by commercial interests. And yet . . .We remix, we mash-up, we digitally cut and paste and juxtapose, we auto-tune speech into melodies…Copia is, in these ways at least, alive and well. Boon offers you a copy of his book to read here. And for more reading on copying, see Jonathan Lethem’s excellent article “The Ecstasy of Influence” here. We’re a choir of Om. is way out of tune. Like, way out of tune. a threat to our euphony. So what to do? What to do? But no one says anything. The most interesting part of James Blake’s live show at the Bowery Ballroom last night was his trio’s seamless use of technology to bring to the stage some of the electronic and otherworldly textures of Blake’s debut album, James Blake. Blake was playing a Prophet synthesizer for his gritty analog keyboard textures along with a Nord stage piano for his acoustic piano sounds. But Blake’s microphone (and his piano) was also feeding into a sampler operated by his guitarist, enabling Blake to be looped and overdubbed and harmonized with himself, building up cumulative textures. The guitarist spent more than half his time “playing” this live sampled material by hitting small rubber pads on the sampler, sometimes playing deep dub basslines on it as well. One wouldn’t think that watching a musician poking away at a little 10-inch plastic box could be much fun, but it really works because you get into the musician’s concentration* once you figure out which sounds in the band’s texture he’s producing. 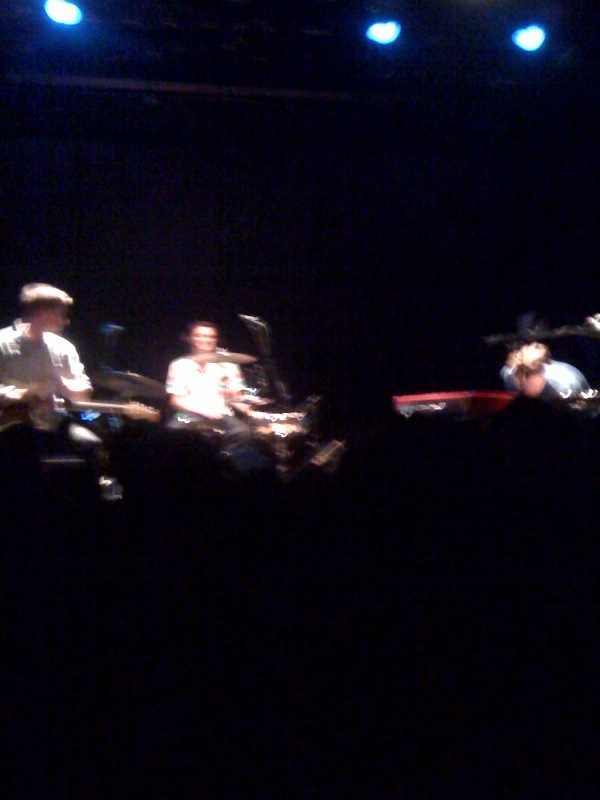 Blake’s drummer used a hybrid electronic-acoustic set up: real hi-hat and cymbals, an electronic kick drum and a multi-pad percussion controller. What this means, for those of you who don’t play such instruments, is that the drummer can trigger any sound he wants on his electronic pads. Thus, one moment he’s playing a crisp, sampled cross stick sound (so key to a lot of dubstep music), the next moment a deep gong sound, and then suddenly a bamboo xylophone-type sound. What’s exciting about this is how the drummer becomes a sample-triggerer, commandeering any sound that has been set up beforehand, making it easy to duplicate the textures of electronic music in a live setting. And of course, seeing all of these sounds played in real time by a stick-wielding musician, connects the listener to the conventions of traditional live music performance. Oh, and before I forget: the band didn’t play to a click track and so the time was elastic and subtle and no one needed headphones. Beautiful. In the end, that’s what made this concert work so well: three musicians were able to produce a whole lot of sound in a truly live way–keeping it self-contained by sampling and triggering themselves, and leaving room for improvisation too. It’s a testament not only to the skill of the musicians, but also to how far electronic music technology has come that performers can use its machinery in such transparent, creative and pleasurable ways.